This is pre-CGI synth punk. If you’ve ever stared transfixed and nostalgic at that Scanners animated .gif of the anchorman’s head exploding, then Nun will just make sense. Gratuitous and malevolent, this Melbourne four-piece recall the hyper-saturated VHS colours of the 1980s: think Cronenberg, Carpenter, and maybe even some of the nastier and weirder filmic visions of that decade, like The Garbage Pail Kids or Troll 2: films that are appreciated for a creepy undercurrent their creators apparently never intended. Nun is colourful and grotesque, yet so immediately appealing that it kinda feels like a virus. But you could throw a pamphlet worth of varying cultish references at Nun and they’d probably stick, because this music is determinedly screwy: during ‘Solvents’, Jenny Branagan’s voice sounds like a choir of squat, razor-toothed monsters, while the discomfortingly cheerful lead line lends a deviant, manipulative tone to the mess. “They used to wash my head in solvents,” she sings, and you know it’s some abhorrent but actually kinda funny initiation ceremony. During ‘Cronenberg’ the synths turn in on themselves, and initially clear melodies slowly turn into a swarm of blunt hypnosis. 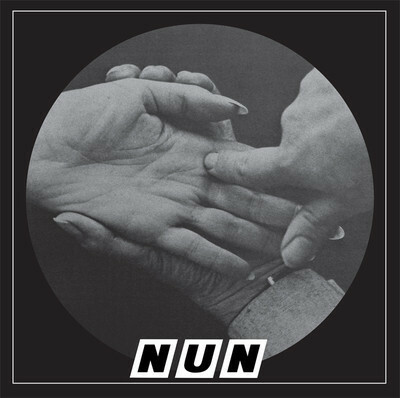 While Nun is less proudly referential, this single is uncannily reminiscent of James Ferraro’s one-off 1980s b-grade love letter Nightdolls With Hairspray. Each record focuses on a different aesthetic – Ferraro teen drama power-pop, Nun sci-fi/horror punk – but the effect is similar: a reminder of the unwittingly strange media we were exposed to as children, when we were at our most receptive, when nothing was obvious and everything held an unfathomable secret. This is a distillation of that titillated sensation of being up far too late after bedtime, and those secrets coming ever so close to being revealed. These crazy kids and their synths. Excellent stuff.